The Hawksbill Turtle is one of the smallest species of turtle. It is characterized by a narrow, pointed beak and a beautiful patterned shell, and it inhabits the warm, tropical coastline waters of the world’s oceans – from the Atlantic Ocean to the Pacific and Indian Ocean as well. It’s difficult to know precisely how many Hawksbill Turtles exist because but research suggests that there are only 5 populations world-wide, made up of around 8,000 turtles in total, and with only 1,000 females nesting annually. Turtles leave the sea to lay their eggs on the beach. They will choose a spot, dig a hole, lay their eggs, cover them up and return to the sea leaving their eggs behind. The eggs will remain buried for around 60 days until they hatch. The sandy seabed provides them with perfect sites for nesting. Hawksbill Turtles nest every 2 to 3 years and lay an amazing 60 to 200 eggs every nesting season! The largest Hawksbill colony in the world nests on the Milman Island in Queensland, Australia. The Hawksbill Turtle is omnivorous. Their narrow pointed beak is a specialized feeding tool, much like that of a bird of prey. Its shape and length allows the turtle to reach into small cracks in the coral reef to extract sponges and other invertebrate. Coral reef sponges are the Hawksbills primary source of food. For most animals, these sponges are toxic due to the spicules (glass-like spines) they contain, however the Hawksbill turtle is immune to this making its competition very small. This type of feeding provides a service to other marine life on the coral reefs, making Hawksbills an important part of the ecosystem, contributing to the health of coral reefs and wider marine life. They also eat sea anemones, mollusks, jellyfish and are known to be opportunistic predators. The beautiful Hawksbill shell is tough and effectively protects them from predators. However, they still fall prey to sharks, crocodiles, octopus and the biggest predator of all, humans. 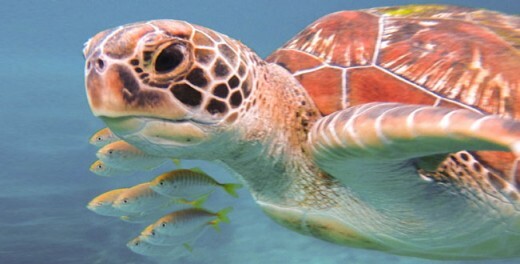 Sea turtles have been swimming in the oceans for much longer than humans have been on the planet earth. These reptiles have existed for the last 100 million years. Sadly, this beautiful creature is the most endangered species of turtle and is the 4th most endangered species on our top 10 list. Their beautiful gold and brown patterned shells, also known as “tortoiseshell”, are hunted and sold illegally on the black market. They are used to create ornamental products and valuable jewelry. In Japan, the Hawksbill Turtle shells, known as “bekko”, has been part of the traditional culture for 300 years and even now is used in traditional wedding dresses. The trade of this turtle shell is illegal in an effort to conserve the population. Despite this, the Hawksbill Turtle shell is still found in souvenirs and jewelry. In fact, it’s the most frequently confiscated illegal item by custom officials.